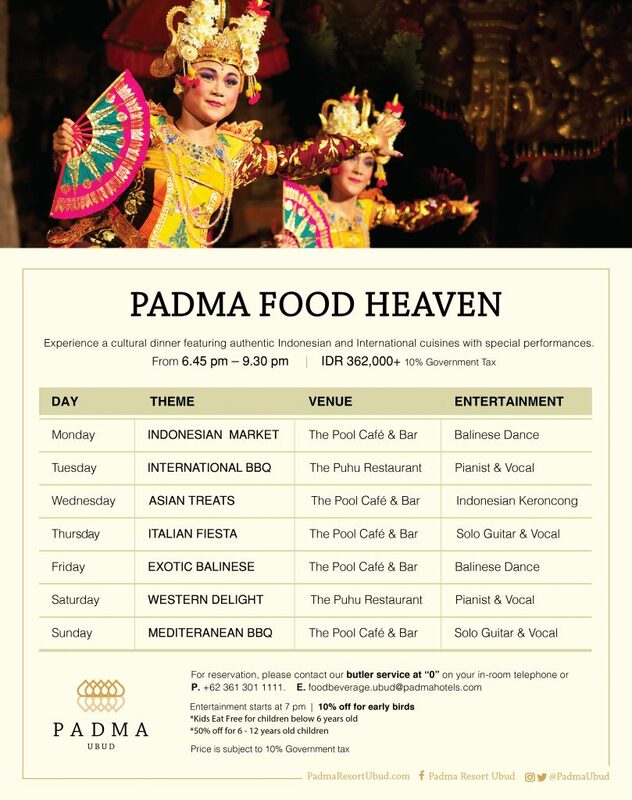 Celebrate the best of food with our Padma Food Heaven. Be a Padma Queen or King of the day with this truly luxuriating four hand massage, combining four different massages of Lomi-Lomi, Swedish Massage, Shiatsu and Balinese Massage performed by two therapist work synchronized helps to improve the blood flow. Taken from the ancient Japanese Massage technique combine with the traditional Thai acupressure, this treatment is done with no oil or dry massage. Great for detoxing, improving circulation and reducing muscle fatigue. Refreshing yourself with an all-natural facial, with ingredients that are so good for your skin, such as yoghurt honey, sugar scrub, cucumber & carrot juice, aloe vera, and many more. Great to re-energise tired skin. For more information and reservation, please contact [email protected]. Experience fishing in our tranquil fish lagoon using a traditional bamboo rod. The best part that it’s perfect for adults or the whole family! 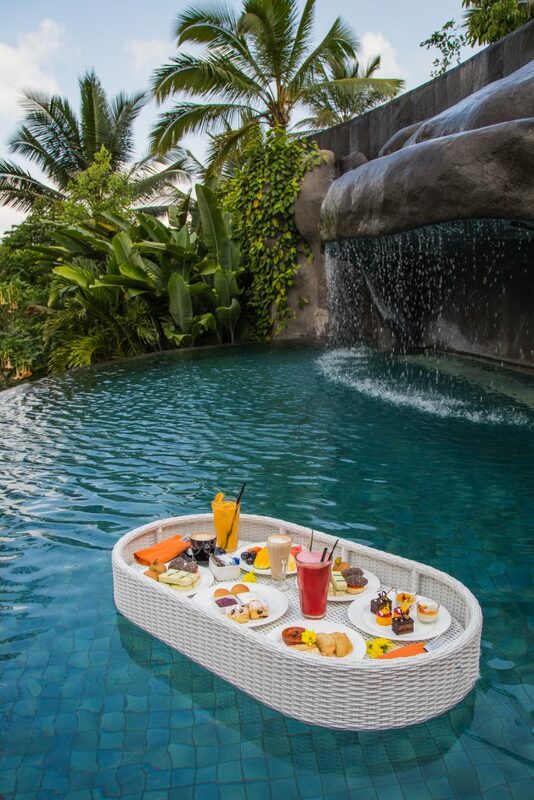 Experience Balinese old-age tradition of Melukat or cleansing of the body and soul, with a magical waterfall stop in between. 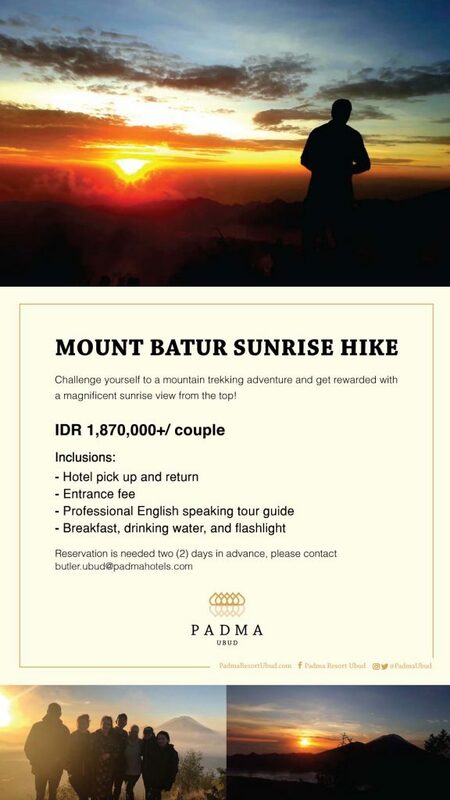 For more information and reservation, please dial +62 361 301 111 [email protected]. 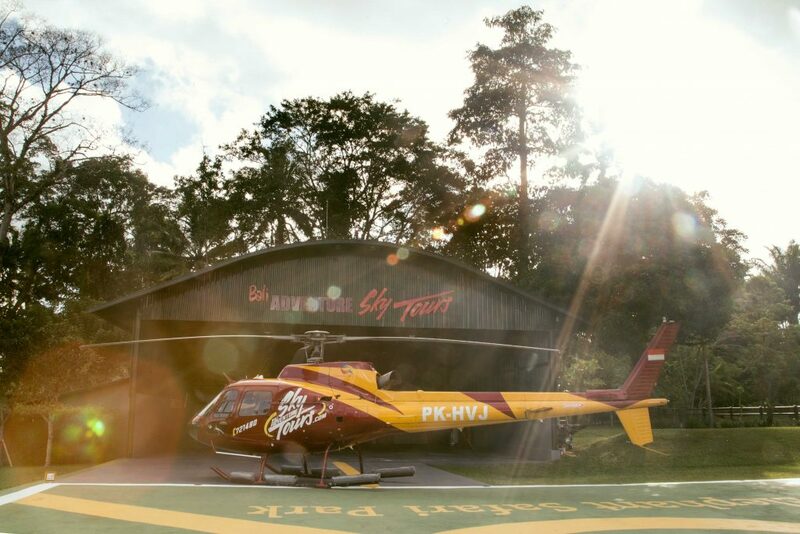 Explore Bali from above with a 30-minute helicopter ride, flying through the spectacular Kintamani, Mount Batur, and Calera Lake known as Bali’s most beautiful Landmark. Departing from Mason Elephant Park in Taro – optional sky tours are available. For more information and reservation, please dial extension 0 from your room, or email us at [email protected]. 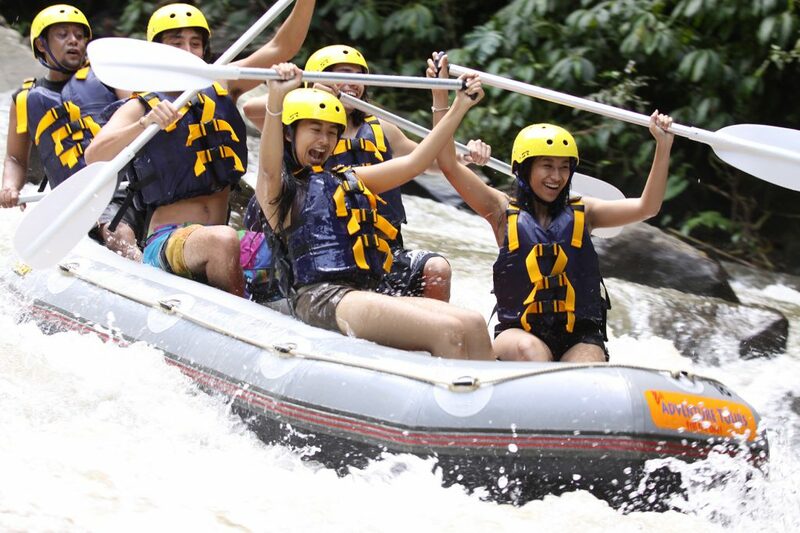 It’s time to challenge your adrenaline. Find out here for unlimited adventure! Who doesn’t like to enjoy complimentary activities that are perfect for the whole family? 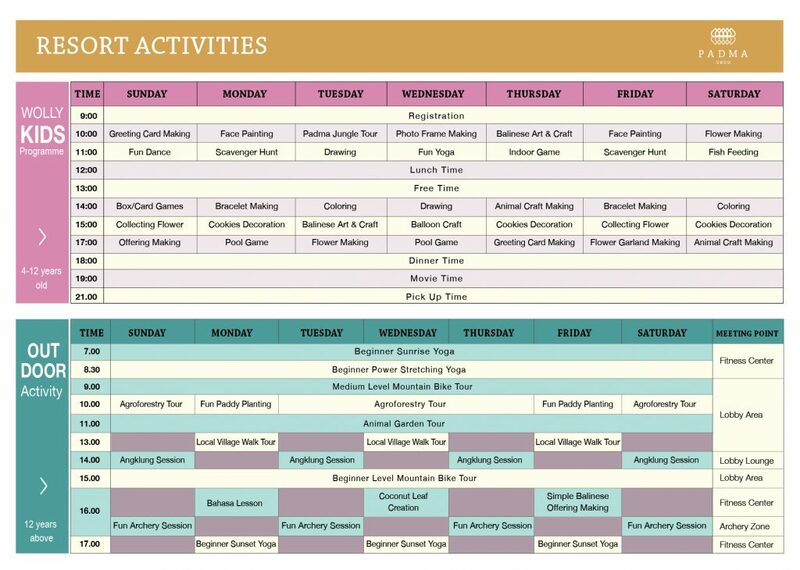 Choose your favourite with our Resort Weekly Activities. Padma Festivity is back! 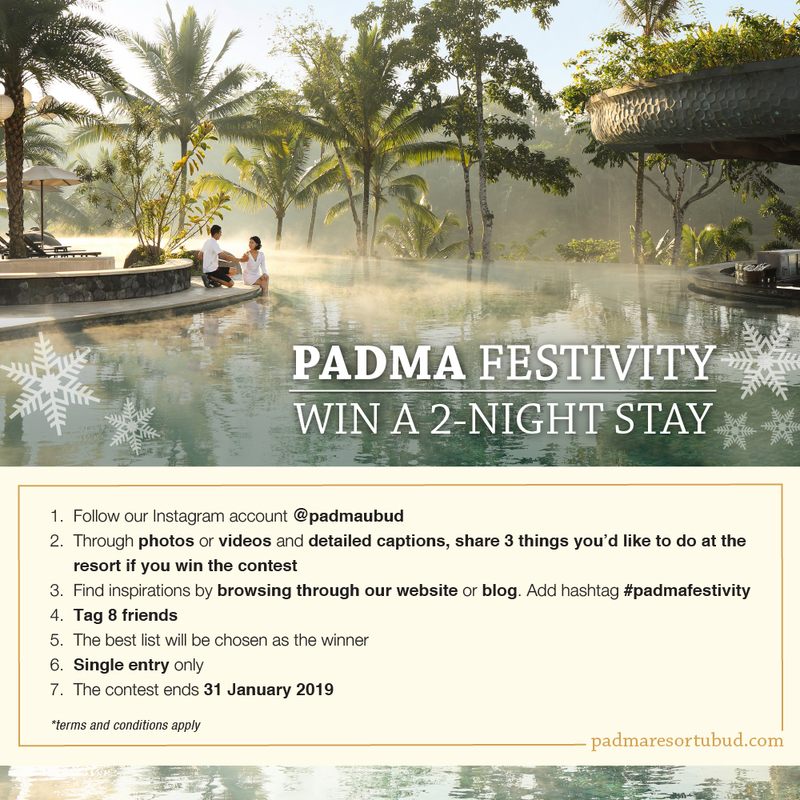 Join the fun of our #padmafestivity by following these simple steps for your chance to WIN a 2-night stay at Padma Resort Ubud.